Here are a few of the things happening in the Philadelphia region next month that are sure to have great attendance. These are all fabulous events for networking, business development, and relationship development. We hope to see you there. The Philadelphia Bar Association will host “A Year in Review: Big Cases - What Was Hot, What Was Not. -- It's Your Call with Lynn Doyle” on December 1, 2009. This event is sponsored by the Bar-News Media Committee, which is chaired by The PR Lawyer (a.k.a. @ginarubel on Twitter) Gina Rubel. Emmy-award winning journalist Lynn Doyle, will lead a discussion with Bar Chancellor Sayde Ladov, Tariq El-Shabazz, Rhonda Hill Wilson and Chuck A. Peruto, Jr. from 12:00 pm – 1:30 pm at the Bar Association. 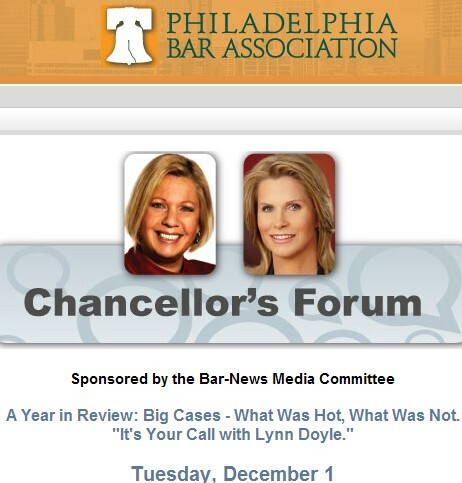 To register, go to http://www.philadelphiabar.org/. Also on December 1, 2009, is the Philadelphia Business Journal’s Women of Distinction Awards Banquet to be held from 5:15 pm - 8:15 pm at the Sheraton City Center Hotel 17 & Race Streets, Philadelphia. To register, go to http://philadelphia.bizjournals.com/philadelphia/. Banker’s Shootout™ − Kimberle Levin and The Philadelphia 100 Alumni Association bring us The Banker’s Shootout™ which will take place on December 4 from 7:00 AM to 10:00 AM at the Philadelphia Country Club, 1601 Spring Mill Road, Gladwyne, PA. Five of the Philadelphia region’s bank CEOs will come together and answer questions about bank financing for businesses. Furia Rubel will be at this exclusive event on December 4, 2009 from 7:00 am to 10:00 am. Speakers include: Bill Aichele, Chairman, President & CEO of Univest Corporation, Gerry Cuddy, President & CEO of Beneficial Bank, Ted Peters, Chairman & CEO of Bryn Mawr Trust, Tom Petro, President & CEO of Fox Chase Bank, Walt Tillman, Chairman & CEO of Vantage Point Bank, Pamela Strisofsky, Managing Director & CFO of TL Ventures, Moderator. Register at http://www.bankersshootout.eventbrite.com/. The Justinian Society of Philadelphia, made up of Italian-American attorneys, judges and law students, will host their annual Christmas party on December 15, 2009 from 6:00 pm - 8:00 pm at The Grand Ballroom at The Ben Franklin, 9th & Chestnut Streets, Philadelphia. This is a fantastic event drawing several hundred attendees every year. To register, go to http://www.justinian.org/events.php?action=view&id=132.